Grilled chicken used to be so blah to me. This is because I find it difficult, when grilling boneless chicken breasts, to pull them off the grill at that magic moment that they are fully cooked but not overdone. 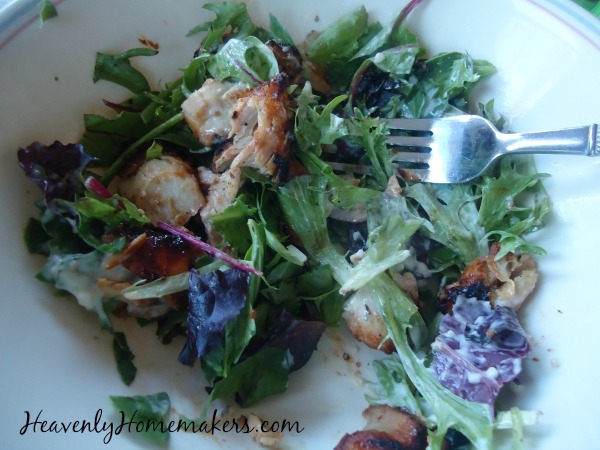 Dry and tough and stringy – I’m just not a fan of boneless chicken breasts anymore. His reply? Don’t use chicken breasts. Use boneless chicken thighs instead. Aha!! And here everyone thought we were serving them the perfect grilled, tender, juicy, flavorful chicken breast. Use boneless chicken thighs instead of breasts. This makes all the difference. As you can see from the picture below, I blackened the chicken more than I meant to – and the meat still turned out juicy and flavorful! This is because chicken thighs have more fat than chicken breasts so they are much harder to ruin. We usually cook boneless thighs for 10-15 minutes on each side, turning it from time to time. Ever since I figured out this grilled chicken tip, I’ve started using boneless thighs just about anytime a recipe calls for boneless breasts – whether I’m grilling or not. The fat in chicken is a healthy fat – all the more reason to enjoy chicken that actually tastes good. Goodbye, boneless chicken breasts. I don’t miss you. Obviously, bone-in chicken is also amazing on the grill. It takes longer to cook, but if you have the time – it’s worth it. 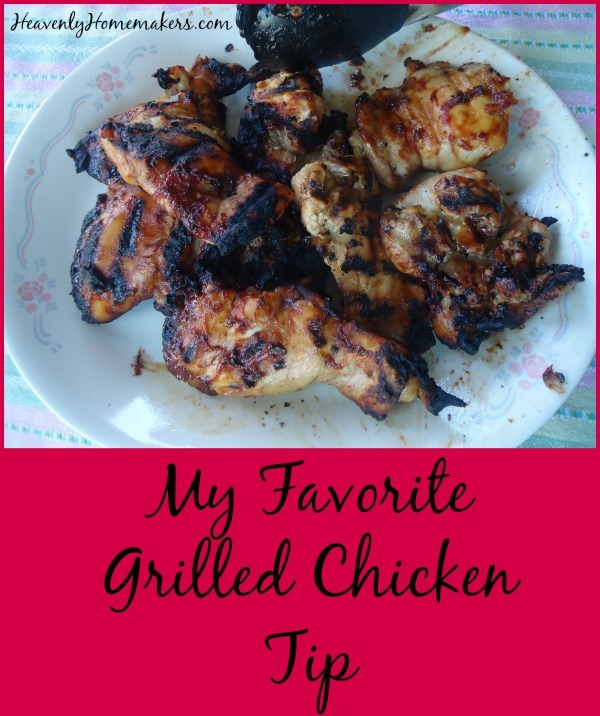 In a pinch (often), I’ve found that cooking boneless chicken thighs on the grill makes for a super quick meal that has become a family favorite! I think we can all agree that super quick meals make us all happy. Monday evening Matt, Elias, and Malachi had soccer practice, Justus had guitar lessons, and I had yoga class. Before leaving, I quickly grilled some chicken. We all met up at home later and got out the Homemade Ranch Dressing, some shredded cheese, and a container of mixed greens. We chopped up the chicken and drooled all over our amazing salads. See how easy that was? Fresh tomatoes would have been amazing in this salad had I had some in the house. We ate almost every piece of the three packages I grilled that night (it’s hard to have leftovers in this house). But if possible, I recommend grilling extra chicken if you can. The leftovers taste amazing cold or rewarmed. Eat it as is, in a tortilla wrap, or in a salad. I’ve discovered that you don’t have to marinate your meat very long before you grill. Several hours is better than 5 minutes – but honestly sometimes I forget (how shocking) and just brush on some sauce or dressing before throwing the chicken on the grill. Grilled chicken thighs are very forgiving. What are your favorite marinades? Sometimes we grill a couple different kinds so guests can have options. We make this chicken almost weekly from March to November. Have you tried grilled chicken thighs? What are your favorite marinades? P.S. While proofreading this, I occasionally read the word “children” instead of “chicken” in my sentences. This made me giggle-cringe and here I am telling you about it. This post is about chicken. CHICKEN. I need a nap. Another quick marinade: orange marmalade mixed with grainy mustard. I suppose if you like hot mustard that would work too. That combo sounds realllly good! Do you just use the frozen chicken thighs? Or do you have a brand you prefer to use? I like the Rosie brand from Azure Standard. They come frozen. If I’m feeding a large crowd and want to save my pricier chicken for my family’s use, I buy fresh boneless thighs at Walmart. I agree on the ease of grilling (or otherwise cooking) boneless chicken thighs over boneless breasts. It is messy, but good!!! Oooh, good point about grilling them with our words. Thanks for the recipe idea! I can’t handle chicken in the bone. When I pull the chicken off next to the bone it turns my stomach. I don’t like dark meat at all. Aren’t thighs little dark? Thighs are definitely considered “dark meat” chicken, but they don’t have that really dark, discolored meat that you usually find next to the bone. You may like them better. That’s my opinion, anyway. I wonder what Laura would say? Yes, they are dark. I’m not always a fan of dark meat (say, in the crock pot) but on the grill thighs are amazing! Try this recipe if you really want the best grilled chicken breasts. I make it for company all the time and everyone always asks for the recipe. It gives the perfect grilling time! We loved grilled chicken thighs. I have a marinade that is mustard, soy sauce, honey and rice wine vinegar that is really good. When I make it I also marinade sliced red onions and grill them. Yummy. The secret to grilling chicken breasts? First pound them so that they are an even thickness. This keeps you from having one end of the breast cremated and the other end not done. Then marinate them, Then learn your grill. I know it takes 7 minutes per side on my grill at low heat to get perfect chicken breast. This took over and under cooking a few times to figure out. I could probably cook them faster on higher heat, but the low heat makes me less likely to overcook them. Have you ever tried grilling your veggies? Just about anything grills. Zucchini is wonderful, tomatoes, egg plant, pineapple, and the list goes on. Slice to thicknesses you want, swish some olive oil on them and then grill. Yum. You can get it (different brand) at the Latin market in York, and I”m sure it’s full of all sorts of sodium, etc, but it makes chicken and pork taste Amazing. You are right–they are delicious! And the “America’s Test Kitchen” folks say the same thing: Always use thighs instead of chicken breast if you can, for the reasons you’ve outlined. We didn’t care for the pasta sauce, but the marinade is to die for! Laura- you are right about boneless skinless thighs. If you are looking to save on food cost- chicken quarters are the way to go since they are usually less than a dollar a pound. I usually buy the quarters and make my own boneless thighs. the legs I save and use for soups and what not. bones and skin go in to making home made chicken broth. I made chicken thighs in the crock pot last week. I did overcook them, but once they were shredded, no one noticed. You are right! I didn’t know that it was due to the fact there were thighs. These thighs were on sale last week or $1.79/lb, the same as the chicken breast. I was just being lazy because the thigh size is smaller and did’t need to be trimmed. We got 2 meals out of $6 of chicken! I usually make breasts and didn’t think this tasted “dark.” Great post! This is the absolute BEST marinade. We use it on chicken and pork chops. This recipe makes enough marinade for 1 gallon size ziploc bag of meat. Leftover marinade can be cooked down to make a sauce or cooked with leftover meat to make stir fry. I look forward to try boneless thighs. I have three marinades I love to use. The easiest is a bottle of Ken’s Italian Dressing with Garlic and Asiago Cheese. The second is great as it is only 4 ingredients. I also use this one on pork. The third one is also just a few ingredients.